The end-of-year wrap-up stresses me out a little as a photographer. It’s the time when we start to see compilations of favourite and best of photos. It’s quite prevalent on Instagram where there is even an app that grids your top nine ‘liked’ photos from the year. I’m not a fan of this myself, because - as I stated on my account last year - my life is about moments and not likes. So, I go ahead and do my own grids, picked by me and not an algorithm based on the opinion of others. Not saying I don’t value the opinions of others when it comes to my photos. It’s always interesting to see the responses and popularity of images when they are posted. It pushes me to challenge myself in skill and creativity. And in the end, it’s nice to see people enjoying the work I share. But that’s just it. I’m sharing my work, that usually comes with a backstory no one will ever see or hear about. And so, sometimes the photos I care about the most are not always the most popular. For brief moments I question their validity, and my validity as a photographer, until I remember that I’m doing this because I love it, and that’s good enough. 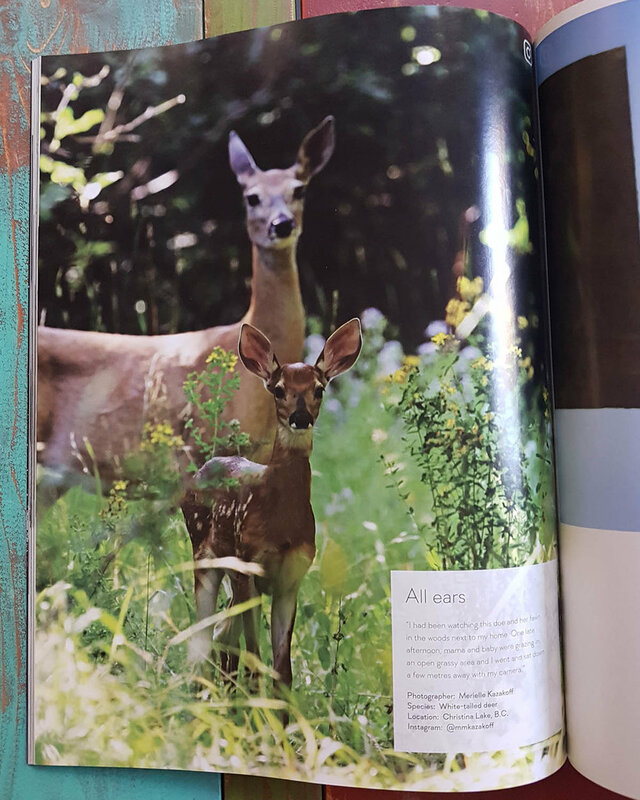 Then there’s the experience of getting a photo published or shared; a photo that maybe I didn’t care about as much, but I get to re-see it again with different eyes and appreciation. It becomes a complicated relationship of attachment to your own work and non-attachment to the outcome of it all. It’s frustrating, it’s fulfilling, and I don’t see myself giving it up anytime in the foreseeable future. A video produced by myself would include a few more moments, and any loss and struggle has not been forgotten. The thing is, I’ve gone from focusing on the want of 2018 to be over, to the looking forward to what 2019 will bring. Onward and upward, as the saying goes. I did two photo compilations this year. My paddleboarding needed to stand on its own. As did my photography. I know how my photos are received socially, so the challenge is to authentically discover my own likes, and to love my work without the bias of public opinion. It’s interesting that the more I share with the outside world to ‘judge’, the more confident I am in doing what I like best. This is also something I am learning to apply to all aspects of my life. So how did I choose the images? Some came from the heart and some came from their backstory; none were winners in a popularity contest (well, one may have been a ‘winner’ in something - thanks CanGeo). I’m not playing favourites for this and I hope you enjoy a brief look back at my year. On the water in 2018… from snow-capped mountains, to early morning sunrises, to smoke so thick you couldn’t see a thing! What 2018 looked like in ten frames… lots of wildlife, landscapes, and water! I haven’t connected with my writing for a while and with the past month’s excitement still fresh, I thought this would be a good time to reflect on things. 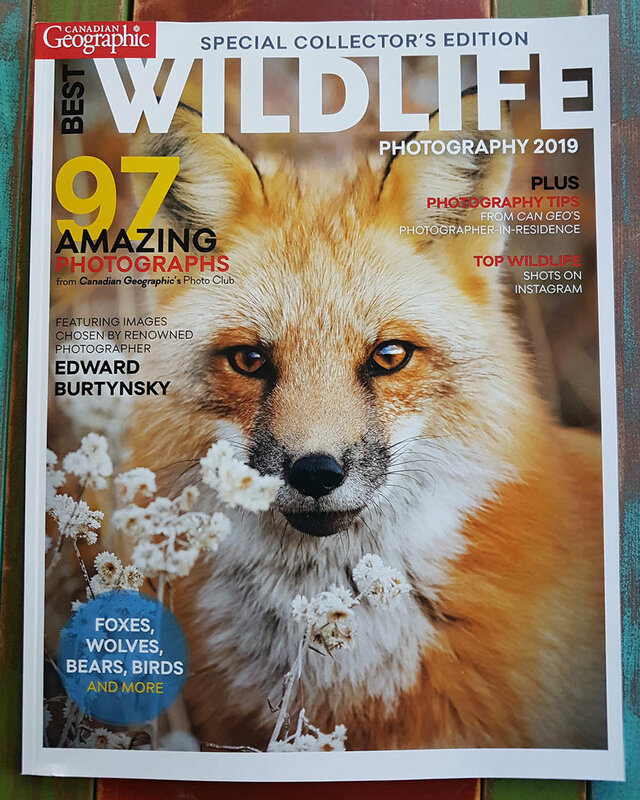 If you haven’t been following my social media, I had a photo published in Canadian Geographic Best Wildlife Photography 2019 special issue. I can pretty much guarantee that for any Canadian wildlife photographer, this is a huge honour. It’s also my first national photo publication. Gorgeous issue, worth picking up. The original shot, shared to my social media. I’ve never really labeled myself as any ‘type’ of photographer. I’ve photographed people, events, products, nature, wildlife… you name it. I’ve studied landscape and macro photography. I was a newspaper reporter/photographer in my early years. I grew up with film cameras, have spent many hours in darkrooms, now shoot with a professional DSLR camera, but still have a waterproof point-and-shoot and GoPro when I’m out paddleboarding. I’m not a huge gadget person, but will get excited over a new lens, or tripod, or printer. I have soooo much more to learn and will sometimes still forget to set my white balance or ISO or have a bad focusing (on the camera) day. I love putting life in my viewfinder, capturing a moment, and sharing it with whoever is looking. And it’s this combination that somehow got me published. I’m blessed to live in the woods, more or less. I’m not a weekend warrior who has to escape the city to look for wildlife. I don’t go on elaborate treks to photograph grizzlies, or wolves, or penguins. Not saying I wouldn’t want to, but I’m immersed in my own wild adventure daily and that’s what I spend a lot of time photographing. My photos are my life and surroundings. I know how lucky I am. This summer I watched my spotted fawn learn to navigate the world, with its mama always close by. I took photos. I shared. And one was noticed on my Instagram by Canadian Geographic. For those who have asked, that’s it, that’s how it happened. I will be honest in saying that I was relieved this was not a cell phone shot and was properly focused. I was able to provide the photo they saw in the quality they needed. If I’m to give any advice through my own experience, it’s to represent yourself truthfully. And while social media has made it all about ‘likes,’ it isn’t about that at all. It’s about what you love. And that’s what gets you noticed and shows through in your work, regardless of what you do. It was October 2017 that I had my first photography show. 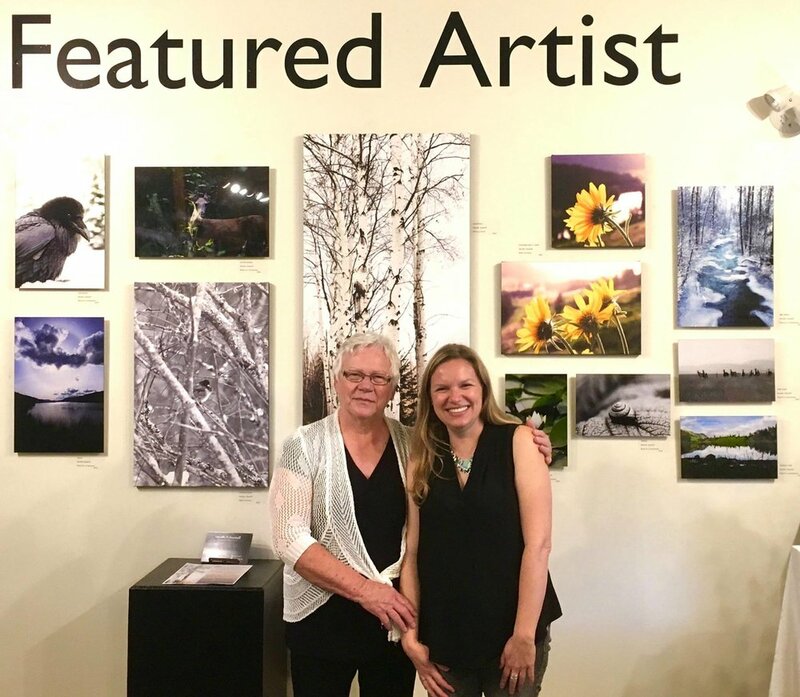 I was Featured Artist at Arts on 3 Gallery in Christina Lake, my hometown. This was a step outside my comfort zone at the time, as I’m not a huge fan of being in the spotlight. But again, I love to share my work, so it was a wonderful opportunity. It also may have been the moment I finally felt comfortable with the label of ‘photographer.’ I’ve not felt comfortable with labels, but I’m learning that it’s okay to stand behind who you are. The saying, “Life begins at the end of your comfort zone,” is so very true. The steps I took with my show, forcing me to step into who I am, were part of the path of getting me to where I am now. And it’s important that I continue to remember this. My mum and I at my opening reception, October 2017. So, in the past year I’ve felt the growth as a photographer happen. I half wonder what next October will bring. I love being a work in progress because there is always something to aspire to and to learn. The community and support I’ve found has also been amazing and I wanted to share a bit of my experience with anyone who may question their own dreams and passions. You don’t have to be the best. You don’t have to prove yourself. You just have to do what feels right and be happy doing it. And don’t hesitate to stand behind your own label. Yeah, I’m a wildlife photographer. But I’m still a portrait photographer, a nature photographer, a stand-up paddleboard photographer, and if truth be told, dogs are my favourite clients. Labels are okay, just don’t box yourself into that comfort zone.